if my iphone turns off what do i do? when it runs out of battery? Just plug it into the computer and run redsn0w again. Click “just boot tethered right now” or something like that and it will work again. If my iPad currently has 4.2.1 installed, do I still need to do the restore in iTunes? why so? do I lose anything? ok, that part is done. now i clicked just booth tethered right now. and again it takes forever. already 15 mins. Hello I’m from Switzerland and you? Ok so I have an iPod Touch 2g MC model running on stock 4.2.1 fw. Everything I’ve read indicates that redsn0w supports a tethered jailbreak for this, but whenever i locate the .ipsw it asks if i have an MC model and i click yes, and it tells me redsn0w 0.9.6b6 doesn’t support the MC models. Am I doing something wrong? I downloaded the ios 4.2.1 file but there is not ipsw file in the folder. Am I missing something? press Windows button + R. type in %AppData% and click enter. Go into Apple Computer folder, and Itunes folder, and finally Update folder. I downloaded the ios file for the 3G and it is a restore.zip file. It does not have a ipsw. However when I click on the 3GS to download, it is a ipsw file. 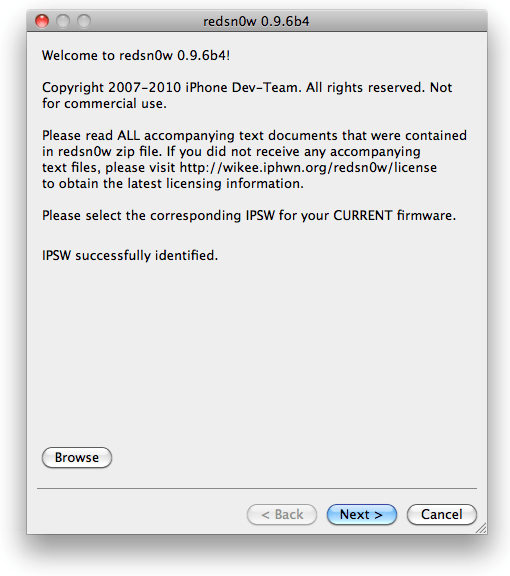 Is there another place to download the correct ipsw file for a 3G iphone for the 4.2.1 ios? Thanks. i dont know what all you people are doing to experience your troubles. took me 25min and done. follow the instructions! Same here, I was even able to skip the restore step with the downloaded IPSW and it worked perfectly. Sure the jailbreaking part took awhile, but it went down without a hitch. i have the same problem with the 2g mc model. it says to check back later even though all sites say it should work. plz, give me idea to how to download insalleous by cydia…..
go back to cydia then search for the installous then download it. when is the untethered one is going to be released? There isn’t a field for me to check Tethered Boot Right Now. I have several options like enable multitasking, install cydia, battery percentage but there is no option to boot tethered. I got as far as finding the ispw file and running it. Then when I hit shift and click on restore.. it ran for a bit then gave me an error that says, “your IPHONE could not be restored. An unknown error occurred (3194). Any ideas? mine is stuck on uploading ramdisk… help? vmatos.what OS u’re using?if lower than 4.2.1.itunes will display that error cause apple is only allowing the latest version. what happen if i plug off my ipad while in jailbreaking process….is it may cause any problem to my ipad? So far here is what I’m getting on an ipod touch, 2nd gen, NON MC, 4.2.1. I go through the entire process without any problems. I turn on my ipod and there is no Cydia. I checked the instructions again and reran the jailbreak again, but not in any area is there a place for me to check or uncheck, tethered boot. I do a search for cydia on my ipod touch and it isn’t on there. So either I’m missing something, even though it says it’s successful, or I’m completely blind. Ok I completely restored my ipod touch 2nd gen, non mc, tried a different download link for redsn0w and tried again. The options are the same, install cydia, multitasking, custom, etc… but nowhere does it say boot tethered, but it appears to go through the jailbreaking without any problems but no where on my ipod is cydia, or anything different. I’m going to try and downgrade from 4.2.1 if possible, i can’t live without cydia or installous! hi…this is my third trying to jailbreak my ipad using another download link…but i dont no why my ipad cannot enter dfu mode…any one help me? i have a 4g ipod touch with 4.2.1 firmware. it says uploading ramdisk then all of a sudden my ipod goes da dink or whatever and its on with no cydia icon and redsn0w is still at two bars on the process of uploading the ramdisk. i got it up two five bars and it quit then i started over and here i am. o and i have windows 7 laptop. how to get ride of the pop up A chance to win Ipad & Iphone4??? I forgot to say after I download Redsnow 0.9.6b4 a pop up appear :A chance to win Ipad & Iphone4 and I can’t by pass it….Please help….Thank you. Please use another links to download redsn0w. this work for ipod touch 4g mc model? does it mean i am tethered with 4.2.1 and future firmware forever since i didn’t save the shsh..? im just tethered in 4.2.1 firmware? There is no option to check for the tethered boot.. Whats up with that? HELP US! I need to travel for work and won’t have a computer that I can install Redsnow so I can reboot my phone while tethered. If I have to turn it off to be on the plane, how can I get it to turn back on? Right now it just sits on the black screen with Apple logo and I can’t get it to work unless I reboot while tethered and re-run Redsnow. Help? What I did was switch to admin, compatibility to xp, and affinity to 1 cpu. That should work for anyone using windows 7.
my computer wont let me download redsn0w, green poison, or anything.Everytime i try it gives me a document in wordpad for it but never the program..wht do i do?? You already tried it with Winrar?? I keep getting “redsn0w.exe has stopped working” message while downloading jailbreak data…. any ideas???? When will un-tethered 4.2.1 be officially publish? i download 4.2.1 for ipod 4g and it doesnt give us the ipsw file, just a bunch of other files that dont show up in Redsnow… anyone got a solution? I have ipod touch 2g, non mc model, running on 4.2.1. I ran redsn0w, and when i select the ipsw file, it scans it, and then says “unable to recognize firmware/ipsw.” ive downloaded so many times, but it never works. please help! Okay, i Downloaded the Firmware Files, but when i go to Restore my Ipod to get the 4.2.1 it doesn’t allow me to restore it with an IPSW file. SOMEONE HELP ME! also i have an ipod touch 4th gen. Okay I got a problem after jailbreaking my ipad I got white Cydia app so I did the fix by booting tethered and now my cydia is fixed. Problem is my internet doesnt work now like i went to settings and wi-fi and it says im connected but cydia says no network connection nor does safari work? Anybody know how to fix this I tried everything from rebooting Ipad, reinstalling firmware and jailbreaking again, nothing seems to work? 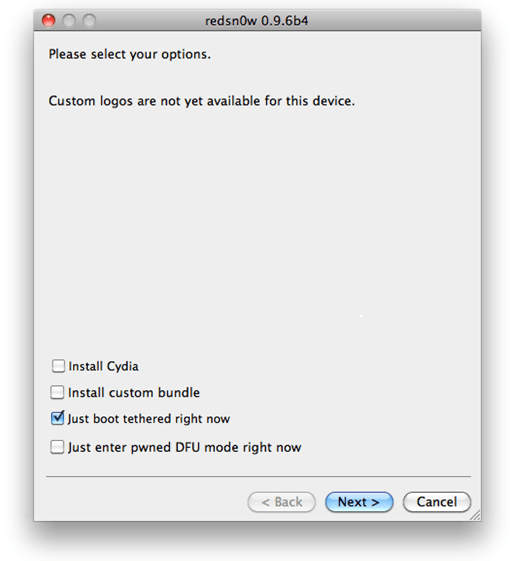 i wanted to restore my ipod 4g but accidently selected “Install Cydia” instead of “just boot tethered right now”. now i cant use it and when i try to restore it it gets stuck at “Exploiting with limera1n” after going into DFU. what’s happening???? I finally finished all the steps and when i went to cydia to download a theme it restarted my ipod, now it is stuck on the apple logo and wont turn on… what should i do??? wait so you can’t download cydia right now? I cannot use any program when I jailbreak already. What can I do next to make it work? my ipod wont turn on after i installed one one the themes and it said to reboot… so wht do i do im freaking out!!?? ?